Casa di Giulio stands at the far end of the private hamlet, at the foot of the castle of Vivo d'Orcia. The house opens onto the piazzetta on one side and a private yard to the back of the house. The restoration of this charming rural building was managed by Daria Cervini, who runs Vivo d'Orcia with her 3 siblings. Her sense of style has turned this house into a place where new meets old in the best of ways. A large glass door leads into the superb kitchen where an old farm table serves as main dining table. Two steps lead into the living room with huge fire place, which also opens up onto the piazzetta. 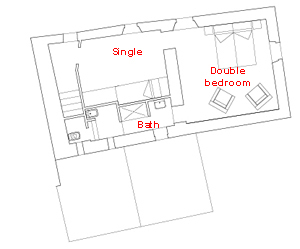 On the same ground floor a twin bedroom with adjoining bathroom has french windows into the back yard. Lovely old terracotta stairs lead to the upper floor. 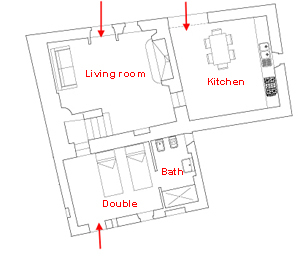 Here a single bedroom which can also be a dressing room leads to the masterbedroom with its bathroom. The view from all the windows is of great charm. Vivo d'Orcia is one of those magical spots where architecture and nature mingle effortlessly and become a place so special you will probably never forget it. The saltwater pool lies at less than 200 m from the house. It is reached down a path that runs along the orchard of the estate. The pool area is surrounded by old walls and accessed through a gate (and therefore safe for small children). Casa di Giulio was better as expected. More than satisfactory! All was there, even a washing machine. One suggestion: have one or two 'chaises longues' on the beautiful terrace, that was the only thing missing. The holidays were perfect, and both owners and staff were extremely helpful. Nous avons passé un séjour MAGNIFIQUE dans la Casa di Giulio. Le domaine Vivo d’Orcia est splendide : un hameau au pied du château, composé de quelques adorables petites maisons et d’une ancienne et très belle église. Ici tout est beau – sans oublier les arbres majestueux, les vergers, la nature environnante, les collines et l’atmosphère extraordinaire de cet endroit magique. Quant à la Casa di Giulio, c’est tout simplement un petit bijou. Elle est ravissante, confortable et décorée avec un goût exquis . Une très belle découverte pour nous dans une région grandiose. Wir sind sehr begeistert von dem Ferienhaus und der Umgebung gewesen. Die Bilder und die Beschreibungen auf Ihrer Homepage können zwar nicht ganz den Zauber einfangen, aber man bekommt schon einen sehr guten Eindruck und freut sich, wenn es dann sogar noch schöner ist. Es war alles zu unserer besten Zufriedenheit. Das Ferienhaus ist sehr geschmackvoll eingerichtet. Man kann sich auch bei schlechtem Wetter gut drinnen aufhalten. Das Drumherum mit den kleinen Gärten, den vielen Wiesen, dem Castell und der kleinen Kapelle lassen einen in eine andere Zeit entfliehen. Das Haus war auch sehr sauber, wir haben gern die Waschmaschine und den herrlichen Wäscheplatz hinterm Haus genutzt. Abends haben wir bei Kerzenschein im Garten unter der Pergola gesessen und die Stille genossen. Also, es war ein rund um perfekter Ort die Seele baumeln zu lassen und die Landschaft auf sich wirken zu lassen. Gerne empfehlen wir dieses Haus und Ihre Argentur weiter und würden uns auch nächstes Jahr wieder über einen Urlaub in Italien in einer Ihrer Unterkünfte vorstellen können.